You learn something new every day. 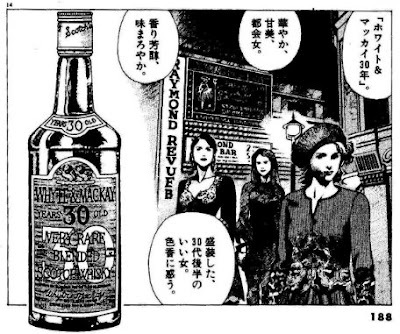 Yesterday, for example, I had no idea that Richard Paterson, master blender of Whyte and Mackay, was a manga hero. 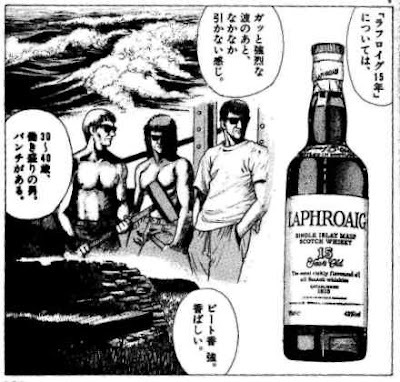 He is a significant character in "Oishimbo #70", a manga (Japanese cartoon book) story about whisky. Oishimbo is a hugely popular series devoted to food and drink connoisseurship. And I mean hugely popular: well over 100,000,000 copies of the nearly 100 book series have been sold (no, I have not typed too many zeros). Oishimbo has reached a still wider audience through serialisation in manga magazines, television anime, a feature film and even a computer game. Making a back of the envelope calculation just based on the book sales figure, more than a million copies featuring Paterson's manga alter ego are probably in circulation. How many whisky guides have ever sold in that kind of number? 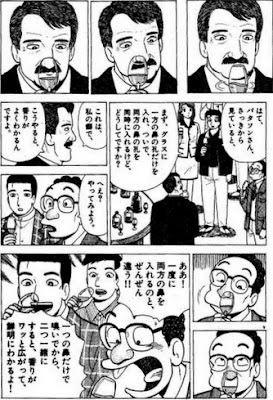 To understand Oishimbo you really need to know that the manga books people sometimes tease middle aged Japanese salarymen for reading are often less like comics and more like text books. Oishimbo has made a kind of a crusade of informing its readers about a wide range of foods and drinks since it was first published in 1983 and has been credited with revolutionising attitudes to food labeling, organic produce, and just good eating in general. There is now a whole genre of food manga, mainly aimed at men (I don't know why it is a male genre), with entire series devoted to the minutiae of specific topics like curry or train station takeaway lunch boxes. 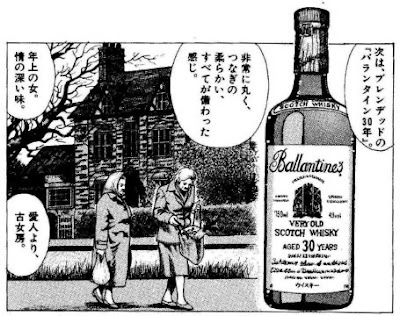 Anyway, "Oishimbo #70" is about whisky. It starts with one of the characters, a middle aged office worker who is bit of a berk, getting really depressed because Scotch blends that were once prohibitively expensive and highly prestigious (Johnnie Walker, Ballantine's, Chivas Regal, J and B) are now accessible to his younger subordinates. The hero Yamaoka and his friends embark on a 125 page exploration of why Scotch is not only distinguished by its price, featuring a foray into the legal definitions of whisky in Japan and Scotland, a quest to find a whisky that would work before a French meal, a visit to Scotland with tours of lots of distilleries, a detailed explanation of the whisky making process, an assault on Suntory's labeling of "pure malts" (I think it was first published in 1999 and Suntory have since mended their ways), a telling of the Masataka Taketsuru story and, at the climax, the appearance of the "Richard Paterson" character to teach the true whisky way. 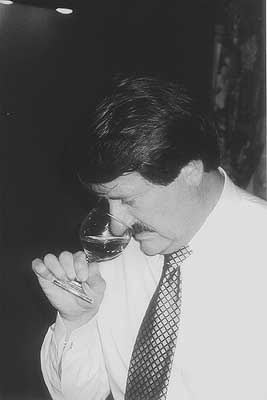 The photograph of Richard Paterson is reproduced, with permission, from the Loch Fyne Whiskies Scotch Whisky Review website. The poor quality of the manga imagery is down to my scanning machine.